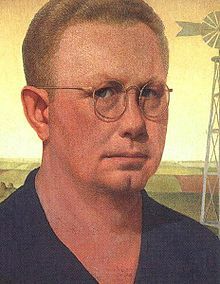 Grant Wood was an American painter. He painted the famous American Gothic. He was 26 when he began his career. His main painting style included a mix of stippling and cross-hatching. He usually painted on beaverboard. His preferred paints were oils and tempera. Wood studied several different ways to paint during his trips to Europe. The paintings of artist Jan van Eyck convinced him to put new styles in his art. This page was last changed on 15 October 2014, at 11:17.